Current President of UWAS.She started UWAS IT Circle in 2012 and has served as chairperson since then. Other than creating new programs to benefit the inmates, she has also collaborated with partners and Institutions to offer many community programs to help the elderly in narrowing the digital divide and the needy children to gain confidence and improve their skills in English.She has also initiated another UWAS new project, Student Enrichment Platform (SEP) using smart technologies to enable underprivileged students to build strong foundation in Mathematics.This project is in collaboration with Ngee Ann Polytechnic and has been rolled out to primary schools. Irene has an MBA in Entrepreneurial Management and her background is in IT specialising in Data Mining. She has been in Data Mining handling all aspects of data analytics & CRM using Artificial Intelligence, Business Intelligence, big data etc., for more than 20 years. 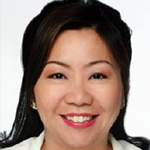 She is the Consulting Director at Integral Solutions where she enabled organisations to make insightful use of data and is the adjunct lecturer at NUS. Irene is very active in community work. She has served at various non-profit organisations including SCWO, ASME, UWAS and previously Business Professional Women’s Organisations, Women Executive Committee etc. She was the Past President of both Federation of Business & Professional Women (Singapore) and Singapore Business & Professional Women’s Association (SBPWA). One of Irene’s initiative as APEC researcher was the organisation of APEC’s first Digital Economy Forum for Women in Singapore 2008. She has also initiated the first APEC Women E-Business training program in Singapore and was requested by MCYS to co-chair the APEC Digital Economy Forum for Women in Singapore 2009 when Singapore hosted APEC. She was also the moderator for Ministerial dialogues at ASME where discussion focus on issues and challenges of women entrepreneurs. She is the chairperson at SMEcentre@ASME which was set up by Spring (now Enterprise Singapore) to offer business advisories to SME’s in Singapore. In terms of research, Irene has led the survey to explore SMEs and E-business in Singapore. The other objective for this survey is to explore if there are any differences between male and female owners of SMEs in terms of challenges and benefits of using internet for their businesses. Amongst the other surveys, Irene has just completed the latest research for APEC on Capacity Building for APEC Women’s Entrepreneurs in the Age of the 4th Industrial Revolution. Irene is not new to SCWO having served as Board Member and Assistant Treasurer from 2006. During her term, she has organised International Women’s Day (IWD 2006) for SCWO which was known as Discovery 120 and last 5 days involving 42 SCWO’s member organisations and more than 80 different activities to showcase women’s achievements and roles. She also chaired the Conversations with Uncommon Women for SCWO in 2007 and invited many inspiring women to have dialogue with SCWO members. She was the chair of the IT Hub from 2010-2014 and worked with volunteers to improve and expand programs at IT Hub to enable participants to enjoy and enhance their learning experiences at affordable rates. She was also a member of the SCWO’s WR sub-committee from 2016-2018. Irene is currently the Chair of Women’s Register (WR) and the Focal point of ASEAN Women Entrepreneurial Network (AWEN).